In theory, there’s no reason why a fully autonomous vehicle would need pedals or a steering wheel. If a driverless car is turning, accelerating and braking entirely on its own, the auto parts that allow humans to perform these tasks become redundant. Removing unnecessary hardware would create more interior space in cars and allow automakers to design more effective safety systems. Plus, if you subscribe to the belief that, in the future, autonomous systems will be better at driving safely than humans by an order of magnitude, then there’s an argument to be made that self-driving cars shouldn’t enable people to pilot their cars at all. Of course, none of that makes it less unusual to see a car interior designed without a steering wheel or pedals. So it’s a bit strange to look at the fourth generation concept of GM‘s electric self-driving car, the Cruise AV, which was revealed at CES. The Cruise AV’s design eliminates the steering wheel and pedals completely, and this is not some design exercise that will never see the light of day. GM said that the vehicle will begin testing on roads in 2019. “By integrating our self-driving system into the vehicle from the beginning, and through close coordination between the hardware and software teams, we have evaluated potential failure modes for all systems, and addressed them throughout development to ensure a safe and reliable product,” GM wrote in a comprehensive statement framed as a self-driving safety report. “This comprehensive, integrated approach to safety, combined with testing in one of the most complex environments in the world, allows us to safely take the next step — elimination of the steering wheel, pedals and other manual controls — from the vehicle,” according to the company. 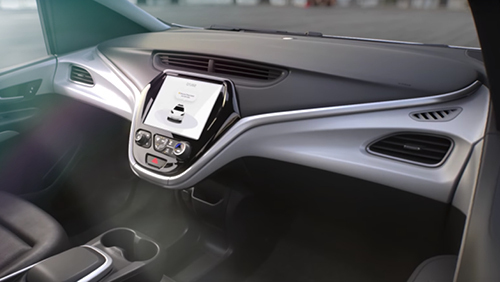 Testing in complex environments has consistently been a key aspect for Cruise Automation, GM’s self-driving subsidiary. This past October, CEO Kyle Vogt described why the company primarily tests its vehicles on the chaotic streets of San Francisco, not so subtly throwing shade at Waymo and other AV developers that largely test driverless cars on the calmer, more uniform streets of suburban Arizona. 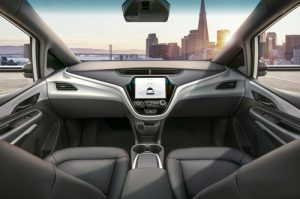 The 2019 testing date of the wheel-less, pedal-less Cruise AV is in line with the timeframe that GM and Cruise have given for introducing their driverless ride-hailing program. Much is still not known about that initiative, including where it will launch (“dense urban environments” is all that’s been said publicly so far). However, by developing a concept vehicle that is so radically removed from those currently on the road, GM and Cruise are continuing their philosophy of taking big steps early on in the process, instead of a series of baby steps. It’s a bold approach that could pay off big.